If you want to take on some fascinating Summer reading during your vacation at the beach this year, try Sian Beilock’s book Choke. It is a very interesting read offering insights into the inner workings of the human brain…especially under pressure. And you may just learn a thing or two about your own experiences on the golf course. For those who have worked with me, heard me teach, or read my blogs, you may have heard me talk about the human internal mechanics and the simple structural model I use to describe how our brain responds to stressful situations. And you’ve probably heard me say: “It’s not the EVENT, it’s how you THINK ABOUT the event that matters most.” Said another way, it’s not the event, it’s how you interpret the event’s meaning to you that matters. 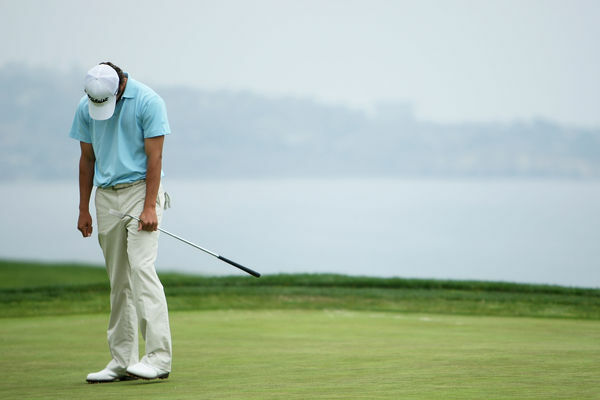 Choking under pressure does NOT have to be a part of your golf experience! She says that fundamentally, your poor performance under pressure on the golf course is NOT because of the situation you are facing…but rather it is because of HOW YOU THINK ABOUT the situation you are facing. And how do you control how you THINK about events as they occur in real time? Well, I believe that a few things have to happen. First, you have to be aware. This means that you must develop the skill of tuning into your mental and emotional state while things happen in real time. This allows you to be more conscious of when unproductive thinking is creeping into your process. Second, you have to prepare mentally AHEAD of time for crazy things to happen. Have you ever noticed that it’s very difficult to pull off a successful bunker shot during your round if you’ve never practiced it? You may also notice that it is also very difficult to respond productively to stress and pressure if you haven’t developed the skill to handle stress and pressure effectively prior to when they show up. This means that you have to practice what you would say to yourself if you miss a critical putt on the 16thgreen. It means you must speak out loud the words you would use if you hook your tee shot into the water on #10. And it means that you must rehearse your inner dialogue for the time when you’re playing partner blows a chance for the two of you to win in a big match. Walter Hagen used to say that in any round, he was sure that he would hit four bad shots. He just didn’t know when. In other words, Hagen was prepared mentally and emotionally for the unexpected. He had a story to anchor to in the times when things went sideways for him. Third, you have to hone the skill of writing new stories for yourself …productive stories that you can anchor to in challenging moments. This is key. Most of the work I do with my clients is centered upon helping them to expand their awareness of the mental and emotional dynamics that prevent them from accessing their full potential in any moment. Today, as you read this, you have a certain potential to play the game of golf at a certain level. It’s based primarily on your skill and expertise (How you swing the club, hit the putts…etc.) For example, if you have learned to hit a 250-yard drive and hit the fairway 50% of the time, then today your potential to hit any given fairway is about 50%. However, whether or not you realize your potential on the course today depends also upon your capacity to manage your mental and emotional state…which is mostly about learning to respond productively to the challenges that inevitably will come your way. The choke or even the mini-choke is simply a function of poor self-management…an inability to realize one’s potential because of the way the stress and pressure of the moment insert itself into the experience. But it is entirely preventable as long as you: tune up your awareness, prepare ahead of time for things to go sideways, anchor to the most productive story (or stories) you can. Paul Monahan, PCC is a Peak-Performance coach, member of the International Coach Federation and a certified COR.E Performance Dynamicsä Specialist. He resides in Cleveland, Ohio with his wife Paula and is the proud dad to three young men. He works with elite-level performers and leaders, helping them to expand their awareness so that they perform at their best more consistently.